When matched with what arises from below. The atmosphere cannot hide what we are. 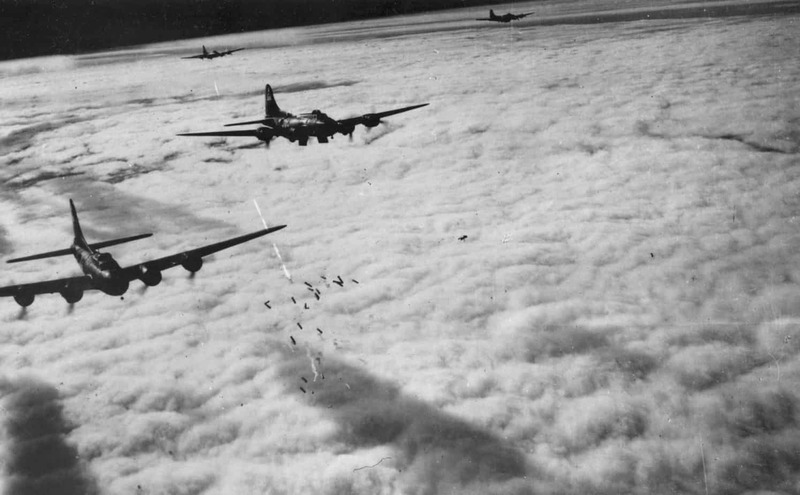 Boeing B-17F radar bombing through clouds over Bremen, Germany, on Nov. 13, 1943 (Photo Credit: U.S. Air Force). This is an Heroic Rispetto, inspired by recent research which has shown that bombing raids by Allied forces during the Second World War produced shockwaves that were strong enough to weaken the Earth’s upper atmosphere. The ionosphere is defined as the layer of the Earth’s atmosphere that is ionized (i.e. atoms in this area have been stripped of one or more of their electrons) by solar and cosmic radiation, and it exists from 75-1000 km above the surface of the Earth. It plays an important part in atmospheric electricity and also influences radio propagation to distant places on the Earth. The shape of the ionosphere and the fraction of ionized particles that it contains is strongly influenced by solar activity, but new research has shown how ripples caused by human-made explosions can also affect this region of the atmosphere. By looking back through daily records collected between 1943-45 at the Radio Research Centre in Slough (UK), researchers were able to measure the relative strength of the ionosphere during this period, and in doing so observed that the electron concentration significantly decreased due to shockwaves caused by bombs detonating near the Earth’s surface at around the time of 152 large Allied air raids in Europe. Further investigation, using less extreme examples, is now required to determine the minimum explosive energy required to generate a detectable ionospheric response, and doing so will help to aid further understanding of how natural forces from below (e.g. lightning, volcanic eruptions and earthquakes), affect the Earth’s upper atmosphere. I am really very touched that our work has prompted such a deep response. I hope that we have added a new dimension to how we view such events as bombing and that a truly global perspective will reduce the possibilities of any further world wars. Thanks to my father who informed me regarding this weblog, this webpage is actually awesome. Thank you Markus – to both you and your father. Thanks Sam. Your poem moved me to tears. It’s been a dark project at times this one, knowing our scientific result came at such a cost. Thank you Chris, the work that you and Patrick have done is truly inspirational. You are so awesome! I do not think I have read through something like that before.